Cremation does not exclude the need to recognize an individual and a life lived; or the need for dignified and respectful treatment of a body including, when desired or necessary, embalming, cosmetic restoration, clothing, and other related care; or the need for a public or private gathering, either with or without ceremony or ritual; or the need to select and arrange for meaningful final placement of a body following cremation; or the need to permanently and appropriately memorialize the life and the individual. The crematory is the location where the cremation process takes place. It can be a part of the funeral home or a separate location near the funeral home. The container is the case a body is in when it is placed in the retort for cremation. It must be made of a combustible material such as wood or cardboard. It can either be a traditional wooden casket, a cremation casket or a specially designed cremation container. The cremation process is one that takes two to three hours to complete at an average temperature of 1800 degrees Fahrenheit. The process results in the complete combustion of a body's organic materials. The remaining fragments are the inorganic materials that comprise a body's bone structure. The cremains are what has been previously referred to as ashes. Cremains is a special word that is a shortened version of "cremated remains" and is used to describe a cremated body. Following the cremation process, the remaining bone fragments are physically reduced to a uniform consistency and size. Cremains of an average size adult weigh between three and nine pounds and take up a volume approximately 200 cubic inches. They are actually much more similar in color and appearance to crushed sea shells or fine gravel than they are to ashes. 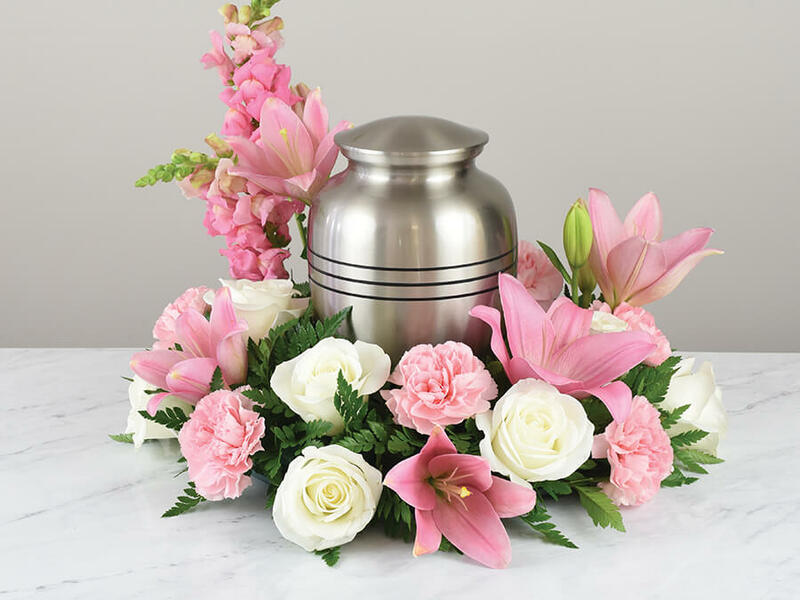 Following cremation, the cremains are sealed and placed in a heavy duty poly liner and then placed in either a temporary container, a utility urn, a permanent urn or a keepsake. A temporary container is generally constructed of lightweight plastic or cardboard. It is specifically designed for the temporary storage or transportation of the cremains. A utility urn is generally constructed of thin utility grade metal with an accompanying outer cardboard box. It too is designed for the temporary storage or transportation of the cremains. A permanent cremation urn or keepsake is generally constructed from one or more of several materials including metal, wood, glass, ceramic, stone and synthetically cultured reproductions of the same. Permanent Cremation Urns and Keepsakes are specifically designed to contain the complete or partial cremains of an individual for an indefinite period of time or permanently.